I’m usually not into scrapbooking. 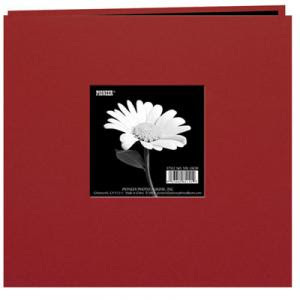 I like very simple albums without sleeves, just mounted photos. 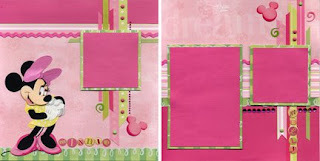 But, since we’re going to Disney World and I definitely want an album of the trip, I decided scrapbooking was in order. I mean, you just can’t fill a leather-bound album with pictures of Mickey and Cinderella without adding a few doodads—or a bunch! Disney just screams “scrapbook me!” Don’t you think? 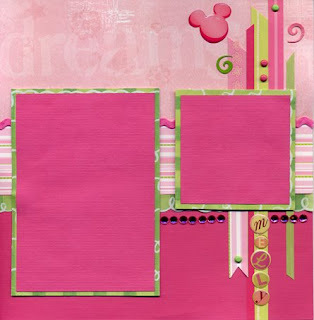 I bought this cute 8"x8" red album (click on photo to see online) to turn into a Disney World scrapbook. Now, I just couldn’t let it sit there in its Michael’s bag until after the trip, could I? So, I gave into its taunting and started making pages. I decided to make pages with frames to put my pictures in later. Then, if I decide I need more after the trip, I can make more. It’s fun and it keeps my mind off the fact that I have to wait 87 more days to start making my Magical Memories. I just can’t keep still with visions of Mickey-shaped balloons dancing in my head. I tell you, I’m dying over here! This is my first Minnie spread. 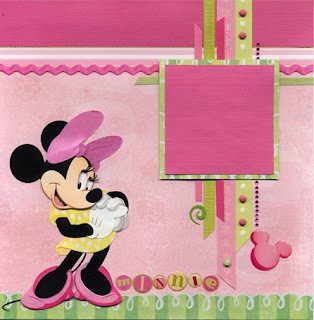 I think the pinks and greens will be perfect for pictures of Minnie’s Country House. I used some pretty papers, ribbon, rhinestones, brads, bubble letters and a Minnie dimensional sticker. What do you think?